On the 29th March (fingers still crossed!! ), I shall be releasing my Corset Kit!! This is the biggest Sewing Pattern and Kit release to date, and has taken me months of prep and sampling to be happy with. The Corset Kit will have a re-usable graded Pattern for a Victorian inspired Over Bust Corset, with an Instruction Zine which will cover every aspect of making up the Corset including tracing off the pattern, marking and cutting out the fabric, inserting the Busk, sewing up and inserting Boning and finishing. The Kit will also include an Equipment Supplies list, notes on fitting, pattern adaptation and alterations and lacing. As with all of the Laura After Midnight Sewing Kits, the above will also be available as a PDF Instant Download- if you simply can’t wait or, like me, already have a stash of supplies and fabric and maybe a little more experience! If this is your first foray in to the world of Corsetry, you will also be able to buy the full Corset Kit which will include all Supplies including Boning, Busk, Coutil and Eyelets. All you will need to do to start sewing is buy your front fabric, thread your machine and make a lovely cup of tea! These kits will be limited so pre-orders will open soon. 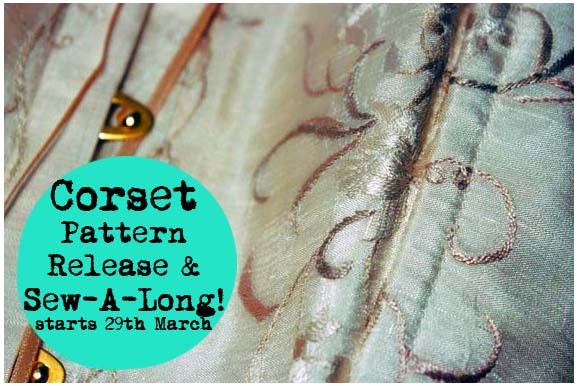 To coincide with this release I will be hosting a Sew-a-Long, which will take you through every stage of creating your very own custom made corset which will start on the 14th April. The release of the Pattern and Kit is timed so that you will be able to order your copy of the Pattern and Instructions or Kit, and gather all supplies needed before joining in the Sew-a-Long two weeks later. Tutorials will cover Measuring for Size, Tracing off and Cutting out, Pattern Alterations, Marking and Preparing to sew your Corset. There will also be the beginning if a short series of Book Reviews. The ever popular Notions series will be Corset centred with this weeks instructing on how to piece Lace. To finish the week I am hoping to host another series of Interviews and Give Aways… watch this space!! Tutorials will cover Inserting the Busk, fitting the Corset with removable Eyelet Channels and alterations. Get your Seam Rippers ready! This week I shall also be sharing some notes on reproducing Historical Corsets, and hopefully hosting another Interview. Week 3 will see Tutorials on how to sew the Boning Channels. As there are several different methods to choose from this will be an interesting week, the Notions post will cover this in more depth, as will the Sewing Zine which comes with the Kit. Another Book Review and notes on 50s, retro and Vintage style Corsets, with a Notions all about the different ways in which you can lace a corset should make this a lively discussion week. Hurrah, we’ll be almost finished, and Tutorials will cover… finishing! I shall also be discussing adding details like feathers, sequins, corset toppers and Historical details like flossing. All of which will probably make this the prettiest week! With a final interview and give away we’ll all be off somewhere splendid to order complicated frivolous Cocktails and show case our gorgeous new Corsets before we know it! So, what do you think? I am wildly excited, as Corsetry is a wonderfully fancy thing to be able to accomplish and I am so looking forward to sharing how with you. After the success of Pattern Month I am also looking forward to seeing what you all make, or take away from it too!